Sale have had a quiet off-season, but Director of Rugby Steve Diamond will be confident that his side can build on an eighth place finish to break into the upper echelons of the top flight. In the fifth installment of our Premiership Preview series, Josh Bartholomew assesses their chances. Last Season: Despite what their disappointing finish suggests, Sale were looking likely to finish in the top six until they lost all of their final three games. 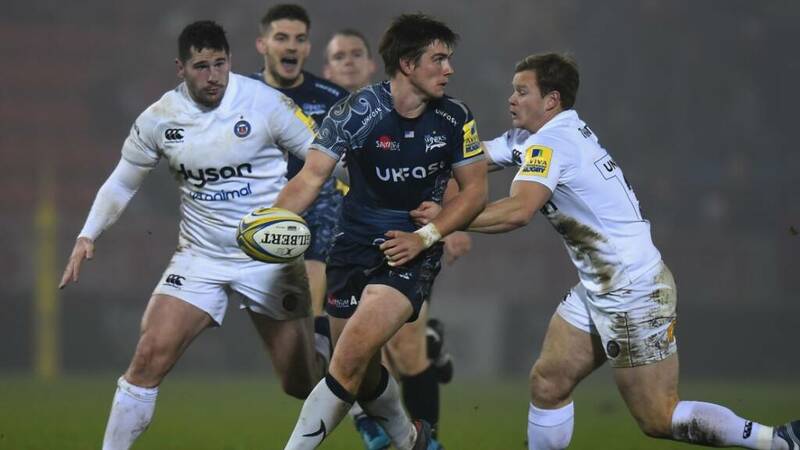 Although they picked up a couple of memorable victories against Saracens and Wasps, there were a number of games in which they let opportunites to pick up points go. The Sharks picked up 14 bonus points (second in the league only to Exeter), which shows that Diamond’s men do not have far to go to compete with the big boys of the division. Recruitment Rating: Though Diamond has managed to catch the eye with the surprising scalp of Chris Ashton, ultimately Sale have failed to improve on the failures of the previous season. Their attack was already very strong, but the two notable scalps (Ashton and Rohan Janse van Rensburg) are both players who will improve a facet of their game that did not need improving. Sale’s recruitment team have not managed to make the necessary changes to their squad, and for this the Sharks’ transfer dealings can only be rated 6/10. Strengths: Any back-line that will need to leave one of Denny Solomona, Ashton, Marland Yarde or Byron Mcguigan on the replacement’s bench is one that can compete with any team going forward. AJ MacGinty looked very adept in steering such talent last season, and should continue to do so. Meanwhile, Sale’s back-row is also very strong: Josh Strauss, Jono Ross and Tom Curry all boast international class which can help make up for weaknesses in other areas. Weaknesses: There is a clear shift in quality between the engine room of Sale’s squad and the backs – the front-row is inexperienced, while the men behind them are lightweight. Though Bryn Evans and Josh Beaumont are both worthy Premiership options, if Sale truly wish to compete for honours Beaumont and Evans will both have to step up their game amid a dearth of other alternatives. Key Man: With the already outlined weaknesses in their forward pack, expect back-rower Jono Ross to play a key role in Sale’s top six bid. Ross – recently appointed captain after an impressive debut season – is a bullocking ball winner who caught Eddie Jones’ eye ahead of England’s tour to South Africa. Fellow second-seasoner Faf de Klerk also plays a vital role in Sale’s plans and must continue to control games as he did in his first campaign. Young gun to watch: Sale have become renowned for producing great talent through their youth academy, and their insistence on offering long-term contracts for its graduates shows a trusting element that is seldom otherwise seen amongst their Premiership counterparts. Welsh second-rower George Nott recently became the latest to sign one such contract, and don’t be surprised if he picks up extensive game time this campaign. Also watch out for Ben Curry, who will be looking to follow in the footsteps of his brother, who started for England in South Africa. Prediction: Though their backs are extremely exciting, it’s impossible to look past the flaws in their squad. A squad which boasts so few quality forwards will always struggle to compete with the better teams in the Premiership, so it’s unlikely that Sale will improve last season’s finish of 8th. Ins: Joe Jones (Perpignan), James Phillips (Bath), Rohan Janse van Rensburg (Lions), Chris Ashton (Toulon). Outs: Mike Haley (Munster), Josh Charnley (Warrington Wolves), Will Addison (Ulster), David Seymour (Sale FC), Halani Aulika (Grenoble), TJ Ioane (London Irish).